Thank you to everyone who has said, “Great! I’ll read your blog. I want to know about your adventures. ” I almost always have written a private journal; it is a bit different when it is for public consumption. Update on Goal Zero Sherpa 50: it does NOT charge a MacBook laptop computer. Apple in all it’s “let’s be different” has an 85 watt charger. Everyone else, and the Sherpa charger, is 40-44 watts. It will maintain, and as I found out, run down the charger, but will not increase the charge. I’m keeping it, however, to charge my iPad, and someday, a phone. 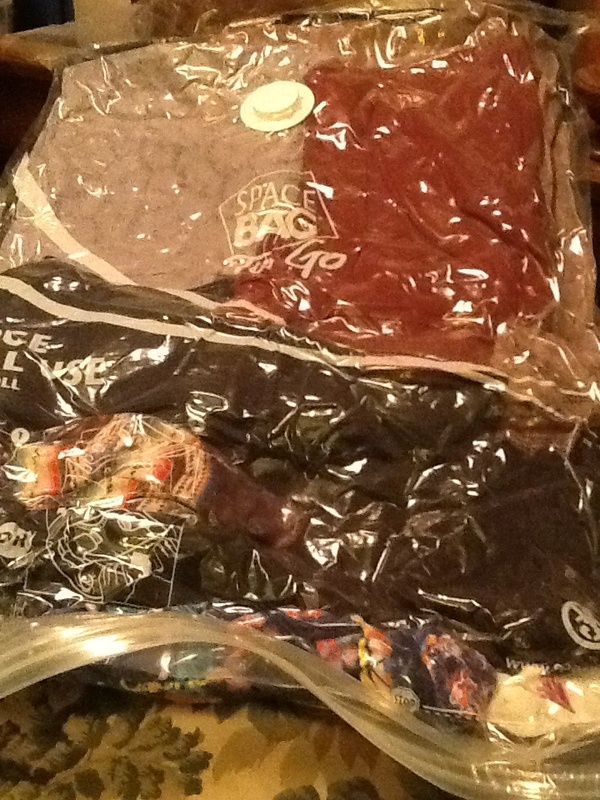 I am packing, weighing, removing, packing, weighing, to get each case under 50 lbs. I’ve always traveled with only one carry-on size suitcase, so it is unusual to have two heavy cases with a two-year focus. One case is mostly electronic stuff and the other is clothes, shoes and miscellaneous. I have been told that I am to be able to move them myself. They are cumbersome and heavy! This last week has been spent at dance class, on walks, long hours at the Apple store for an upgrade and technical help, a lovely trip to the nearby Pacific Ocean, lunch and dinner with friends, and saying goodbye “for a while” over and over. My friends have planned a farewell party for this Saturday afternoon and lots of friends are coming. It is a bit overwhelming; I’m not really a party person. Ian says it is not entirely for me; others want and need to say goodbye and wish me farewell. I have been asked many questions about where I will be, what I will be doing, where will I live, what the education system is like, will I have electricity, when can I have visitors, etc. The answer is usually “I don’t know.” I will let you know when I know. 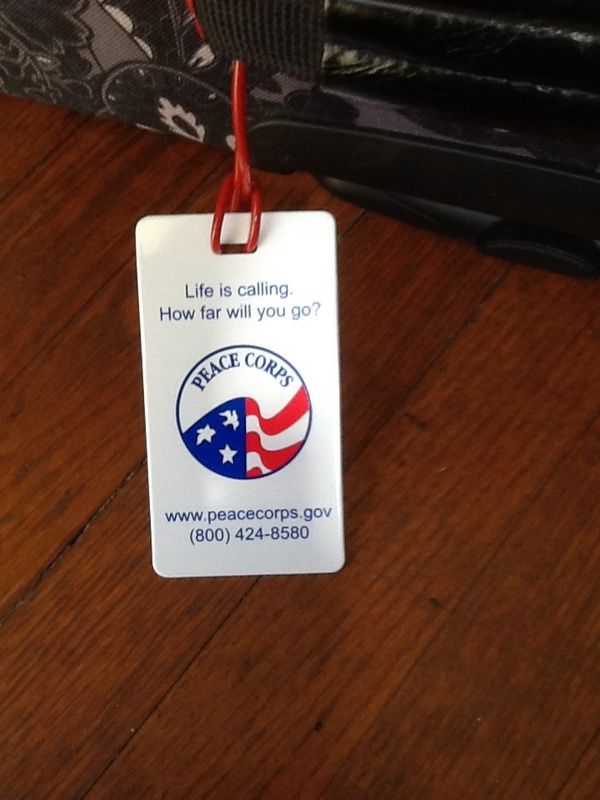 The luggage tag was given to me when I went to a Peace Corps event in San Francisco. All returned Peace Corps Volunteers and “invitees” (me) were acknowledged. It is like joining a club and only people who have done it can really understand the experience. I haven’t done it yet but I want to and I want to be in the club. Two weeks from now, I will get on an airplane and fly to Philadelphia for “staging”. This will be the first time I will meet the other South Africa Peace Corps volunteers. On July 2, we all get on an airplane at JFK/NY and fly to Johannesburg. For the last 11 months, I have been waiting (not particularly patiently) for this adventure to start and very soon, it will. I am excited, hopeful, scared, full of doubts and dreams, and often wondering what the hell I was thinking to make this crazy thing happen. At the same time, right now I am still home in Redwood City, line dancing three times/week, volunteering at the Second Harvest Food Bank, spending time with my fabulous granddaughter, 11-year-old Sadie, spending time with friends and family, taking long walks with women friends, and studying Zulu words and phrases. This adventure is all in my head so far, this bittersweet parting soon to happen, this 27-month commitment soon to start. Yes, there are two suitcases slowly filling with clothes, shoes, watercolor supplies, crochet needles, chalk, solar charger, flashlight, medicines, and games. Yes, my closet is just about empty. Yes, I have a long “to do” list I’m working through. However, I am still home, not in South Africa. Waiting. Waiting seems to be a common theme in Peace Corps blogs and stories: waiting for the interview, waiting to be accepted, waiting to hear where you are going and what work you will be doing, waiting for medical clearance, waiting for staging information, waiting to GO! It is an endurance test! Was it designed to be one? This week is our regular “Nana Camp” where Sadie comes and hangs out with me in Redwood City. We will even be working in a quick trip to a cabin in the Sierras with friends! Pack, repack! Bike riding, reading, overnights with a friend, screen time — all part of a week with Nana. Except we both know, next summer — no Nana Camp. The following summer — no Nana Camp. I’m testing the solar charger Lori bought for me to use. Goal Zero Sherpa 50. It charged my iPad but didn’t charge my laptop. I need to call the company tomorrow. Maybe I’m doing something wrong with the wrong cord in the wrong slot. I’m not very tech savvy.